The Norse Tarot has been designed to conform with the majority of traditional Tarot interpretations. The illustrations should convey recognizable meanings to the practiced reader. Anyone first learning the Tarot with this deck will be able to apply their skills to other decks with ease. In every case a presentation has been sought which conveys the meaning in both an original way and in a form compatible to the Nordic theme of the whole. The Court cards however (the King, Queen, etc. ), have been changed slightly. The Page is now the Prince and the Knight has become the Princess. This eliminates certain difficulties that might arise when using Tarot Spreads which require a card chosen to represent the questioner. The images of the Major Arcana may, in some instances, appear radically different to those of traditional Tarot decks, but in all cases their interpretations remain the same. The cards of the Tarot deck are divided into two parts. The first part is the Major Arcana consisting of 22 cards, and the second is the Minor Arcana with 56 cards. The Major Arcana is generally considered the most important of the two. Numbered sequentially from O to 21, its cards represent the archetypal forces of nature. For purposes of divination they may be interpreted individually, but as a whole they convey a story of spiritual unfolding. They provide a detailed symbolic account of a progression from innocence through workday knowledge and achievement to spiritual rebirth. The Norse Tarot uses the symbolism of the Northern peoples, taking as its theme the central subject of their mythology. The first card, the Fool, shows Balder, the pure god of the sun. The following cards picture other Northern gods and mythological events. These represent the various stages of Balder's development and important turning points in his life. 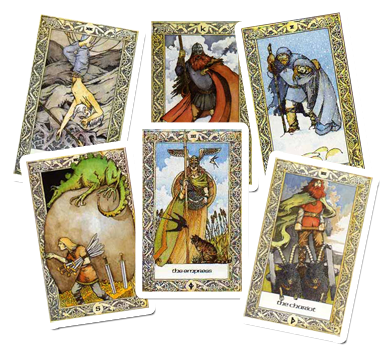 Each card of the Major Arcana is also assigned a rune character. This provides further depth to their interpretation. The meanings of the runes are more general in nature than the cards and so must be read within the context of the neighbouring cards, and for this reason reversed interpretations (for upside-down cards) are not given for the runes. The Minor or Lesser Arcana is divided into four suits of 14 cards each. These Tarot suits correspond to the four suits found in a standard pack of playing cards. However in place of the three Court cards found in a pack of playing cards (King, Queen and Jack), the Tarot has four. In the Norse Tarot these are King, Queen, Princess and Prince. The remaining cards in each suit are numbered from one to ten, and their interpretations are conveyed by the illustrations they bear. Each suit represents one of the four elements, fire, water, air and earth, and also the astrological signs associated with each element. The symbolism of the elements appears prominently in the Court cards. Flames are shown on those of the suit of Wands, water on those of Cups. The people illustrated on these cards are dressed in colours corresponding to their element; the Wands of fire are clothed in red, the Discs of earth in green or brown, and so forth. On a more mundane level, each suit represents an aspect of daily life.